Get your cash on the same day with Kathlego Cash Loans. Apply, get approved, get cash at the click of a mouse. If you are a foreign national and have a passport and a valid work permit, you may apply. A credit check will be conducted after application is received. 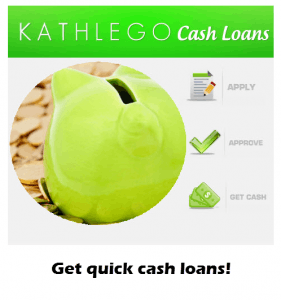 Whether there is an emergency situation or you just need some extra cash now and cannot wait until your next payday, an online payday loan is the perfect solution for you.